A monkey stands in a dancing attitude. He touches his diadem with his right hand, nabdab, and points forwards with the index-finger of his left hand. His tail is curled round his right arm. His feet have hoofs which are split and spurred. He has salmon-pink skin with blue spots. He has horns on his head. 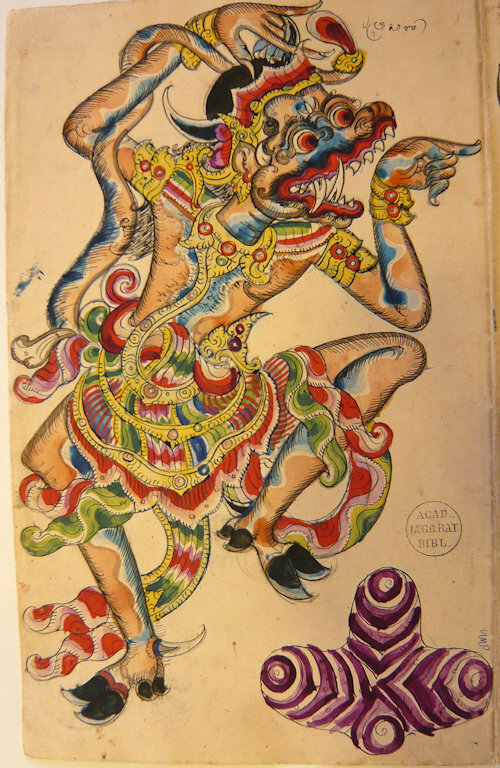 A text in Balinese script at the top reads: “wresaba;”, by which Wresaba, the monkey with the appearance of a bull, is meant. He is mentioned in the Old Javanese Ramayana, XVIII: 17 and XIX: 41 as being among the best of the monkeys.